Unity revive some unusual ideas about speaker design to come up with this innovative and effective monitor system. When Unity Audio launched their Rock nearfield active monitor in 2009, few imagined, I suspect, that its launch would mark the beginning of a whole new range of monitor products. But now, with the intriguingly christened Pebble and Bam Bam, Unity boast a complete range of monitors, from the midfield Boulder, via the Rock MkII, to the Avalanche active subwoofer. As you will perhaps suspect from its idiosyncratic name, the Pebble and Bam Bam is not a conventional active monitoring system. The Pebble element is a compact active two–way speaker comprising a 130mm aluminium–cone bass driver, a 35mm soft–dome tweeter and two channels of 180W of Class–D amplification and associated filter electronics. The less conventional Bam Bam element, however, is a variety of active speaker for which I don’t believe a suitable descriptive name has yet been coined. It’s not a subwoofer, because subwoofers are traditionally designed to operate down to very low frequencies and often configured to operate as mono sources. Subwoofers also often find themselves employed specifically to reproduce the LFE channel in multi–channel AV monitoring. The Bam Bam, in contrast, is designed only to be used in stereo pairs and, rather than reach down to the extreme depths of low–frequency bandwidth, is just intended to add an extra half octave or so to the bottom end of the Pebble’s bandwidth. 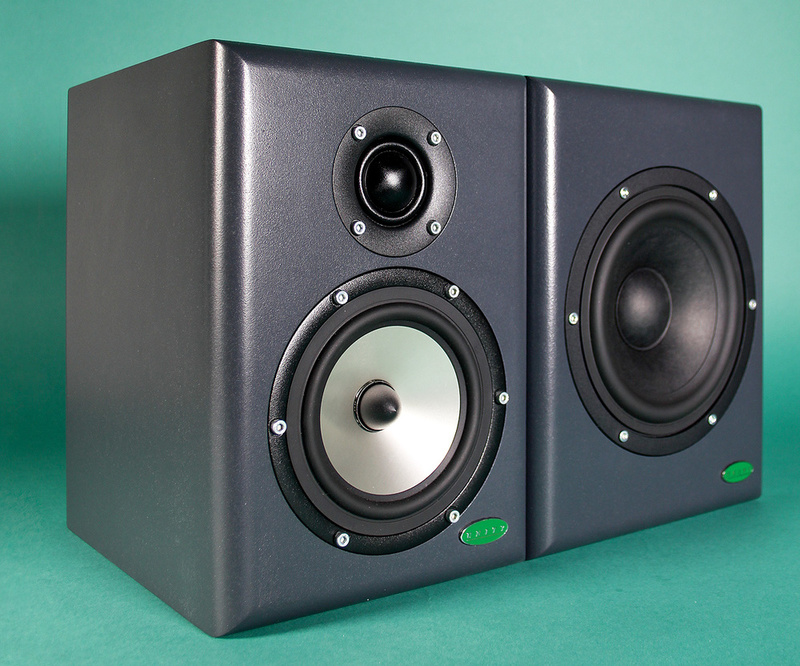 The Bam Bam is also far smaller than a typical subwoofer: in fact, it’s only just slightly larger than the Pebble. The height and depth of the Pebble and Bam Bam are identical; only the Bam Bam’s width is slightly greater. So, rather than being a subwoofer, the Bam Bam is a dedicated low–frequency bandwidth extender: a ‘bandwoofer’ perhaps? Use Bam Bams with Pebbles, and you have a three–way, rather than two–way, nearfield monitor system. Both the Pebble and Bam Bam are of conventional construction, with MDF cabinets, finished in a somewhat underwhelming dark–grey textured paint, with radiused edges that will reduce corner diffraction to some extent. They’re not the last word in ground–breaking industrial design, but then perhaps that’s best left to style–fest consumer technology, and has no place on monitoring tools? Along with its common dimensions, the Bam Bam also incorporates amplification electronics closely related to the Pebble’s. The same 180W Class–D device is used in the Bam Bam to drive a single, 180mm–diameter ‘paper’ cone driver. So, while the Bam Bam without the Pebble is approximately as useful as a chocolate teapot, the Pebble without the Bam Bam makes for a perfectly viable compact active nearfield monitor, and that’s how I began using it. Jumping into how the Pebble and Bam Bam perform is for later, however, because there’s a fair bit of description and electro–acoustics to cover yet. The fundamental idea behind aperiodic loading is hinted at, none too subtly, in its name. The Latin root of the word ‘period’ effectively translates to resonance, and the ‘a’ implies without. So an aperiodic speaker is one ‘without resonance’. The resonance in question is of course the fundamental low–frequency one of the moving parts of the driver ‘bouncing’ on their own suspension and enclosure air volume. That resonance not only approximately marks the point at which the low–frequency response of a speaker begins to fall away, it also causes, to a greater or lesser degree, the time–domain response of the speaker to degrade — it begins to add delay to the input signal (reflex–loaded speakers generally have worse time–domain performance than closed speakers because, put simplistically, they have two such resonances — the driver and the port). If the resonance can be suppressed by damping it out, although the frequency response will still fall away, the time–domain response will change less (and more slowly). So that’s the primary aim of aperiodic loading: to suppress the fundamental low–frequency resonance. There are, of course, other resonance–damping mechanisms within speakers that can do the job very effectively, the primary one being electrical damping provided by the driving amplifier. The multiple degrees of low–frequency response freedom provided by modern active EQ techniques are way beyond the wildest dreams of the early speaker engineers who tinkered with acoustic resistance, so one could argue that the time for aperiodic loading has been and gone. However, as I’ve probably expressed previously within these pages, I wonder if there’s a tendency within speaker engineering these days to believe that ‘real’ electro–acoustic engineering can be supplanted by electronics and is consequently not quite as significant as once it was. So Unity, I think, should be applauded for not looking only to electronics for acoustic salvation. 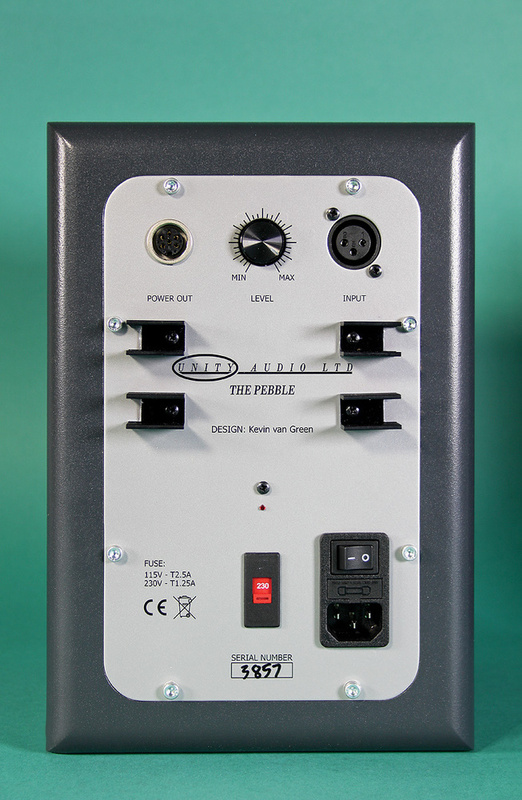 The Pebble's rear panel is a simple affair, featuring just an XLR input and gain trim knob, and a five-pin socket for sending power to a Bam Bam.Aperiodic loading traditionally involves what might be described as a precision leak. A hole somewhere in the cabinet is fitted with a semi–permeable, flow-restrictive medium that serves to suppress the low–frequency resonance by dissipating the energy in the air pumped backwards and forwards by the bass–driver diaphragm. Unfortunately it’s not a realistic prospect for an aperiodic vent to completely dissipate all the resonant energy, moreover it’s not entirely simple to create a vent that’s purely resistive — a vent is almost bound to have a resonant character of its own. So the actual result is that traditional aperiodic loading tends to behave either as a closed-box speaker with a leak, or a reflex speaker with a lossy port — take your pick. However, as ever with speakers, it’s not a free lunch. Firstly, it’s not that easy to create a completely linear acoustic resistance (especially when the acoustic impedance either side of the vent is so different), and secondly, venting to the open air means the chuffing noises that inevitably result from air being forced through a restrictive medium can be audible (chuffing noises also, in themselves, point to some non–linearity going on). So there is the potential for air–flow non–linearity with aperiodic loading — however, there is one respect in which it beats electrical damping hands down: it’s potentially more linear in respect of volume level and thermal effects. The conventional electrical damping provided by a driving amplifier reduces as voice–coil resistance rises with temperature. So the low–frequency performance of a speaker will tend to become less well damped (with maybe an output peak at resonance and increased low–frequency delay) the longer and louder it is used. This thermal phenomenon doesn’t effect the damping provided by aperiodic loading, however. From my point of view, that’s a big plus. Having written that aperiodic loading involves a hole in the enclosure, you’d be hard–pressed to find it on the Pebble and Bam Bam. This is because the Pebble and Bam Bam are configured as a variation of traditional aperiodic loading where the acoustic resistance doesn’t vent to the open air but into a second internal chamber. This idea was, as far as I’m aware, first introduced commercially by UK hi–fi manufacturer Naim Audio on their SBL speaker of 1986. Interestingly, the designer of the SBL, Roy George, began his speaker engineering career at Goodmans, where he would have probably come across the old (by then) Acoustic Resistance Unit. Although using an Acoustic Resistance Unit (to borrow Goodman’s term) between two internal cabinets doesn’t offer quite the same damping potential that’s promised (but probably never delivered) by traditional open–vent aperiodic loading, it has some significant advantages. Firstly, because the whole cabinet is fully sealed, there’s no opportunity for chuffing noises to make themselves heard. Secondly, rather than vent to the open air and potentially create a reflex–like resonance, venting across an internal boundary means the speaker will retain closed–box characteristics. Lastly, the mechnical non–linearities of a vent that’s passing a significant volume of air are reduced. To my mind, if it’s engineered well, the inter–cabinet resistive vent definitely falls into the ‘neat idea’ category. Moving on now to the other end of the Pebble/Bam Bam spectrum, there’s a satisfyingly symmetrical element of unconventionality at the top end of the Pebble’s bandwidth too. Granted, it’s a relatively small detail, but it does perhaps have some implications for the sound of the speaker. The detail in question is a larger–than–usual tweeter dome. A larger dome unavoidably means a more directional speaker, and where a 25mm dome tweeter will be typically around 8dB down by the time it gets to 20kHz when measured 30 degrees off axis, I’d expect a 35mm dome, as fitted to the Pebble, to be around 12dB down under the same conditions. This may not seem all that significant, but it has some implications for the way the speaker is likely to sound and the way it drives the acoustics of a listening environment. All other things being equal, there’ll be less high–frequency reverberant energy. The reason for using a larger dome than usual is perhaps related to the use of an aluminium cone for the Pebble’s bass/mid driver. Aluminium cones can perform extremely well in terms of the basic requirements of strength and light weight, but when they begin to lose the plot at higher frequencies and become resonant, they tend to do so with no little enthusiasm. 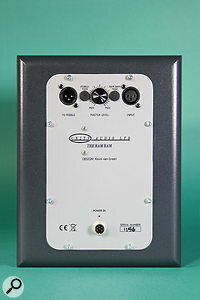 So there’s likely to be a significant high–Q resonance at the top end of the bass–mid driver’s response that needs to be suppressed — and that demands a relatively low crossover frequency between the two drivers, which in turn means the tweeter should be larger than usual so that it can operate with good power handling and low distortion down below the more usual 3kHz crossover frequency (the Yamaha NS10 has a low–ish crossover frequency and a large–ish tweeter too). I am going to get around to describing how the Pebble and Bam Bam sound very shortly, I promise, but first a bit of description of what’s around the back of the cabinets is probably required. The Pebble, at first glance, looks completely conventional. There’s a balanced XLR input socket, a mains socket and switch, an LED power indicator and an indented gain control. Getting the Pebbles working is as simple as plugging in, switching on and setting the gain. Connecting the Bam Bams to the system is a little unintuitive at first, but makes sense when you think about it. Along with the features I’ve mentioned, the Pebbles also have on their rear panels a screw–secured multi–pin socket. 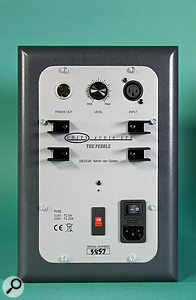 To connect a Bam Bam to a Pebble, a jumper cable from the Pebble multi–pin socket to an equivalent socket on the Bam Bam provides power, and a short XLR-to-XLR jumper cable gets the audio signal from one to the other. The slightly unintuitive nature of the arrangement is that when Pebbles and Bam Bams are connected, the signal from the DAW or desk arrives first at the Bam Bam. The Bam Bam is the master in terms of signal, but the slave in terms of power. Also initially unintuitive is the gain–control arrangement when Pebble and Bam Bam are connected: the Bam Bam’s gain control affects the whole system and the Pebble’s gain control affects just the Pebble. The back of the Bam Bam. Unity recommend that, when Pebbles and Bam Bams are used together, the input gains on all speakers should be set to maximum.Unity suggest that when Pebble and Bam Bam are used together, both controls should be set at maximum, which is fine, but if you feel the need to adjust the balance between Pebble and Bam Bam you can end up somewhat chasing your tail, as changes to the balance also change the subjective level. There are further controls, hidden behind removable plugs on the Bam Bam rear panel, that enable balance adjustment, but Unity suggest their use is probably best left to somebody who genuinely knows what they are doing and perhaps can analyse the results. I started with just the Pebbles set up in my usual compact monitor position, on very solid wall shelves either side of the workstation. First impressions were good, but also slightly surprising. These days I’m used to nearfield monitors with a bright, explicit kind of tonal balance that leaves you in no doubt that you’re listening to a speaker that drags every last detail, kicking and screaming, from the audio (even if that detail sometimes turns out to be a mirage). The Pebbles are slightly different, sounding a little reserved and undemonstrative. They are detailed and certainly very capable of doing the monitoring job, but they seem to do it with a lighter touch than many a nearfield monitor of my experience. There is an element of BBC monitor voicing about them: warm and natural in the vocal region, with a restrained top end. The restrained top end may be a conscious voicing decision (one I applaud), but it’s possible that the narrow dispersion of the larger–than–usual tweeter is also responsible (although at my advanced years I perhaps shouldn’t be jumping to subjective conclusions concerning audio above, say, 12kHz). At the other end of the Pebble’s bandwidth, where the aperiodic loading does its thing, the undemonstrative character continues. Despite the Pebble being of decidedly compact dimensions the bass is all there (although I don’t feel it goes quite as deep as the published spec would suggest), but it doesn’t draw attention to itself. Now, normally, this is the kind of bass I admire, but I was not entirely convinced by the low end of the Pebble — it’s lacking a little punch to my ears. With the Bam Bam connected, however, the whole system seems to wake up. The slightly reserved character and relatively warm tonal balance is still apparent, but the extra half octave added at the bottom end, and perhaps the Pebble’s bass/mid driver being relieved of its bass duties, makes a significant difference to the sense of scale, clarity, and the bass ‘punch’ it’s not far off midfield monitor territory. So where does that leave us? In bringing aperiodic loading back from the near–dead, the Pebble and Bam Bam constitutes an innovative and unusual approach to nearfield monitoring, and that’s absolutely to be celebrated. Disregarding my slight misgivings about the bass of the Pebble alone (and I can’t really see Pebble users holding out long before adding a pair of Bam Bams), they do the compact nearfield job well and they do it with a relaxed and unfatiguing tonal balance. Adding the Bam Bam adds, subjectively, far more than just half an octave to the bandwidth, and clearly demonstrates that three–way speakers can have a genuine advantage over two–way. If you go for a pair of Pebbles you’ll probably be very happy with them, but it seems to me there’s really no option but to save–up for a pair of Bam Bams. There’s a million and one alternatives to the Pebble on its own, but the combined system is in a bit of a price niche. The Neumann KH310 is the only three–way anywhere near the same price. Other alternatives might be the Focal Twin 6 BE (but it’s not three–way) and the Adam S3XH (which is three–way, but more expensive). Compact and very capable monitoring system. Especially good with the Bam Bam also connected. Slightly disappointing bass performance on Pebble alone. On its own the Pebble is an unusual, cost–effective and very competent compact two–way nearfield monitor. 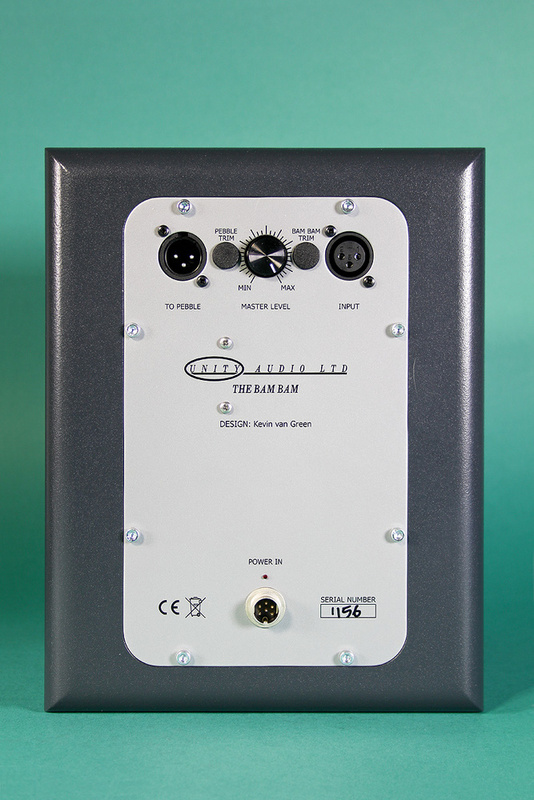 Adding the Bam Bam, however, creates a seriously capable three–way monitoring system. Pebble £1295, Bam Bam £1075. Prices are per pair, including VAT. Pebble $1799, Bam Bam $1599. Prices are per pair.